On the 18th April 2014 at 6.45 local time in Nepal a large group of Sherpas, who were in the middle of fixing ropes at the mountain, were hit by an avalanche. 16 Sherpas were killed making it the worst mountain accident ever at Mt. Everest. The avalanche struck at an altitude of only 5,800 meters, only 450 meter higher than the popular Everest Base Camp at 5,364 m. The Sherpas were fixing ropes so as to prepare the way for the numerous tourists who are currently at the mountain in an attempt to summit the mountain. Since Sir Edmund Hillary conquered Mt. Everest in 1953 the mountain has claimed more than 300 lives. On the 18th April 2014, it sadly claimed another 16. So far 14 people have been reported killed by the avalanche which struck a group of Nepali mountain guides (sherpas) fixing rope on the mountain early in the morning. With 14 fatalities so far it’s the most fatal accident ever at Mt. 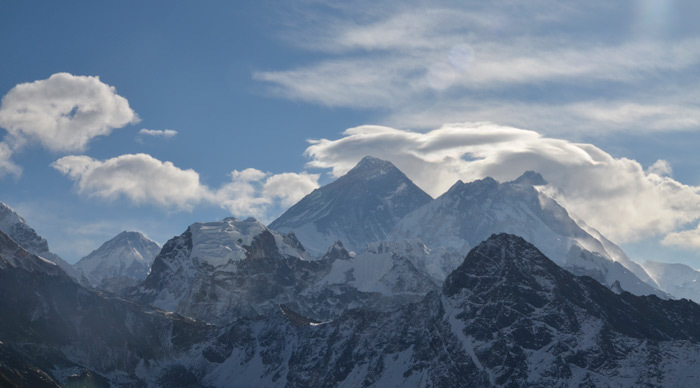 Everest, the world’s highest mountain. 9 people dies in an avalanche setting off at 4.00 am in the morning sweeping away up to 25 tents from Camp 3 at an altitude of 6,800 meters. 11 people loses their lives in just 1 day, with falling blocks of ice being the primary cause. For more information on this incident, “No Way Down – Life and Death on K2” written by Graham Bowley is an interesting read. A large block of ice falls down and initiates a 200 meter wide avalanche heading directly towards 15 mountaineers. 7 of them manage to escape while the remaining 8 are pulled away and killed. 8 people loses their life on Mt. Everest in one day, including the famous mountaineers Scott Fischer (founder of Mountain Madness) and Rob Hall (founder of Adventure Consultants). The incident was caused by sudden and very adverse weather conditions causing the fatalities to take place at three different places at the mountain. For more information on this incident, “Into Thin Air” written by John Krakauer is a good account. 40 mountaineers lost their lives when an avalanche crashed through their camp at an altitude of 6,000 m.
Adverse weather conditions encloses 2 teachers and 7 students who all dies on the mountain as a result of the cold weather. Similarly to the 2012 accident which killed 9 people an avalanche kills 15 people at a height of 6,500 m.
7 people are killed by an avalanche while they were attempting to cross a bridge made of wooden logs, to get over a gorge. 1 person was able to escape the avalanche. 7 Canadian teenage kids gets killed by an avalanche. 16 people, 7 Germans and 9 Sherpas, looses their lives in an expedition funded by the Nazi government in Germany. Should you find that we have missed out on any fatal mountain accidents, please do not hesitate to let us know.